Letrero en Chicago. (Sign in Chicago.). Photo by Seth Anderson; licensed via Creative Commons. The concept of verb conjugation is the same as in English — only the details are far more complicated. Verb conjugation refers to the process of changing a verb form to provide information about the action being performed. The form of the verb can give us some idea about who is performing the action, when the action is being performed, and the relation of the verb to other parts of the sentence. To better understand the concept of conjugation in Spanish, let's look at some conjugation forms in English and compare them with some Spanish forms. In the examples below, the English verbs are explained first, followed by the corresponding Spanish forms. If you're a beginner, don't worry for now about what terms like "present tense," "auxiliary verb" and "indicative" mean. If you can't understand what they refer to by the examples given, you will learn them in your later studies. This lesson isn't intended to be an exhaustive analysis of the subject, but rather just enough that you can grasp the concept of how conjugation works. To talk is the infinitive form of the verb in English. It is the basic form of the verb, by itself conveying no information about the verb action. It can be used as a noun, as in "To talk in public is difficult." (Some grammarians classify talk by itself as the infinitive). The same things are true of Spanish infinitives; they convey no information about the verb action, and they can be used as nouns. Infinitives in Spanish always end in -ar, -er or -ir. The verb for "to talk" is hablar. I talk, you talk, he talks, she talks, we talk, they talk. In English, an "-s" is added at the end of most verbs to indicate that it is being used in the third-person, present-tense singular form. No suffix is added to indicate any subject other than the third person (someone other than the person speaking, also known as the first person, or the person being spoken to, the second person). Thus we say, "I speak, you speak, he speaks, she speaks, we speak, they speak." In Spanish, various endings are attached to verbs to indicate who is speaking for first-, second-, and third-person forms in the singular and plural. For regular verbs, the -ar, -er or -ir at the end is replaced with the appropriate ending. Examples: yo hablo, I talk; tú hablas, you (singular) talk; él habla, he talks; ella habla, she talks; nosotros hablamos, we talk; ellos hablan, they talk. In many cases the verb form gives enough information that it isn't necessary to indicate with a subject noun or pronoun who is performing the action. Example: canto, I sing. I will talk, you will talk, he will talk, we will talk, they will talk. In English, the future tense is formed by using the auxiliary verb "will." For the future tense, Spanish uses a set of verb endings that indicate who is performing the action as well as indicate that it is happening in the future. Examples: hablaré, I will speak; hablarás, you (singular) will speak; él hablará, he will speak; hablaremos, we will speak; hablarán, they will speak. I talked, you talked, he talked, we talked, they talked. In English, the simple past tense usually is formed by adding "-ed." Spanish endings for the preterite tense also indicate who performed the action. Examples: hablé, I talked; hablaste, you (singular) talked; habló, she talked; hablamos, we talked; hablaron, they talked. I have talked, you have talked, he has talked, we have talked, they have talked. In English, the present perfect is formed by using the present tense of "to have" and adding a participle, which usually ends in "-ed." The rule in Spanish is basically the same. Forms of haber are followed by a participle, which usually ends in -ado or -ido. 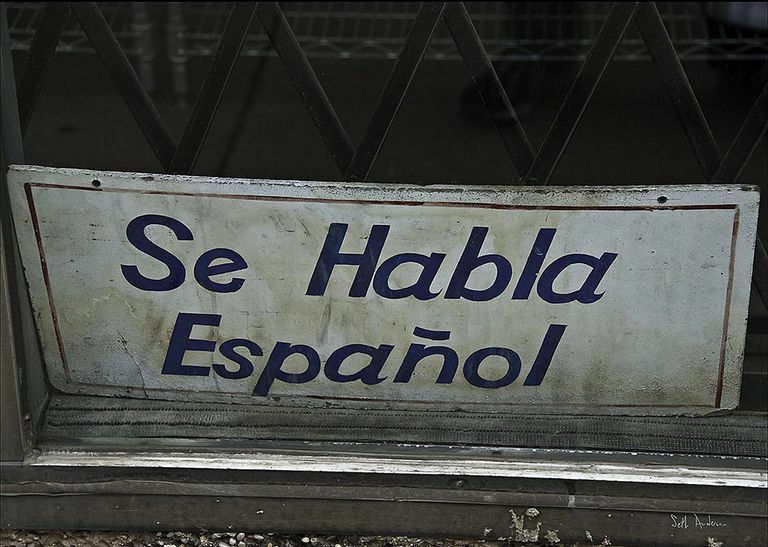 Examples: he hablado, I have spoken; él ha hablado, he has spoken. I am talking, you are talking, she is talking, we are talking, they are talking. English forms a gerund by adding "-ing" to the end of verbs and uses it in conjunction with forms of "to be" to indicate a continuity of action. Spanish has a corresponding form that ends in -ndo and is used with forms of estar ("to be"). But it is used less often in Spanish than in English. Examples: estoy hablando, I am talking; estuvo hablando, he was talking. If I were rich ... If that be the case ... English sometimes uses the subjunctive mood to indicate something that is hypothetical or contrary to fact. Distinctive forms for the subjunctive mood, although they used to be somewhat common, are nearly absent from modern English conversation. Spanish also uses a subjunctive mood, but it is far more common than in English. Going into details about its use is beyond the scope of this lesson, but it is usually used in dependent clauses. Example: In Quiero que ella hable ("I want her to talk," or, literally, "I want that she talk. "), hable is in the subjunctive mood. Talk. English has a simple command form based on an unconjugated form of the verb. To give a command, you simply use the infinitive without the "to." Spanish has both formal and familiar requests that are indicated by verb endings. Examples: hable (usted), habla (tú), (you) talk. In some circumstances, such as in recipes, the infinitive can also function as a type of comand. I could talk, I would talk, I could have talked, I will have talked, I was talking, I will be talking. English uses several auxiliary verbs to convey a sense of time for a verb's action. Spanish uses the verb haber and/or a variety of endings to convey a similar sense of time. Most learning Spanish as a second language learn these forms at an intermediate level. As you can see, the verb forms are much more extensive in Spanish than they are in English. Complicating things is that the most common verbs are usually irregular, as they are in English ("I go," but "I went," and "I see," but "I saw"). The important thing to keep in mind is that Spanish usually uses endings to more fully convey the nature of the action, while English is much more likely to use auxiliary verbs and other sentence components.